Shipboard flow injection analysis (FIA) data of dissolved metals from the GT10 (KN199-04) cruise. Samples were collected using GO-FLO bottles and filtered through 0.2 µm Acropak filters. Concentrations and quality flags are reported for each metal. The samples (with the exception of surface samples) were collected for trace metal determinations at 11 stations from the RV Knorr using a custom-built US GEOTRACES trace metal clean rosette consisting of an epoxy painted Al rosette frame containing 24x12 L GO-FLO bottles (Cutter and Bruland, 2012). Immediately after the package was recovered, the tops of the GO-FLO bottles were covered with plastic bags and the bottles were removed from the frame and carried into the US GEOTRACES clean van for sub-sampling. The GO-FLO bottles were pressurized to 10 psi using 0.2 µm-filtered compressed air and samples were filtered through 0.2 µm Acropak filters. All sub-sampling was undertaken in the clean van using rigorous trace metal protocols. Surface samples are from the towed fish surface sampling system. FIA Standards: Shipboard mixed standards (Al and Fe, Mn) were prepared in the shore-based laboratory by serial dilution of commercial Al, Fe, and Mn standards (BDH Aristar) into distilled water which was acidified with the equivalent of 4 ml sub-boiled 6N HCl. Standards for instrument calibration were prepared daily from filtered seawater by acidifying 1 L of low Fe seawater from a previous cast with 1 ml of 6N HCl and microwaving for 5 minutes to reach a temperature of 60 + 10°C. After 1 hour, 200 + 2 ml of the cooled seawater was added to each of three 250 ml PMP bottles each of which had been rinsed three times with the microwaved seawater and shaken dry. Working standards were prepared by adding 0, +100µL, +200µL spikes of the shipboard mixed standard to these bottles, to yield a standard curve of +28.4nM and +56.81nM for Al, +1.26nM and +2.53nM for Fe, +5.11nM and +10.22nM for Mn. The system blank from the addition of the acid and buffer to samples was determined by double spiking a replicate sample i.e. by adding 2 x 125 ul 6N HCl and 5 ml of sample buffer to the replicate bottle and comparing the resulting signal to the original sample. Dissolved Al Concentrations: Dissolved Al was determined using a Flow Injection Analysis scheme with fluorometric detection. Major components were a Rabbit peristaltic pump, a Dynamax FL-1 fluorometer, a Rainin A/D board and a Macintosh G3 computer running Rainin MacIntegrator v 1.4.3 to log and reduce data. The analytical scheme produces a complex between lumogallion and dissolved Al which when excited at 484 nm produces fluorescence at 552 nm. Detailed description of the methodology is published in Resing and Measures (1994). A 3-minute pre-concentration of sample (~9 ml) onto an 8-hydroxyquinoline (8-HQ) resin column yielded a detection limit of 1.02 and a precision of 1.94% at 17.58 nM. A 3-minute pre-concentration of sample (~9 ml) onto an 8-hydroxyquinoline (8-HQ) resin column yielded a detection limit of 0.064 nM and a precision of 3.1%. 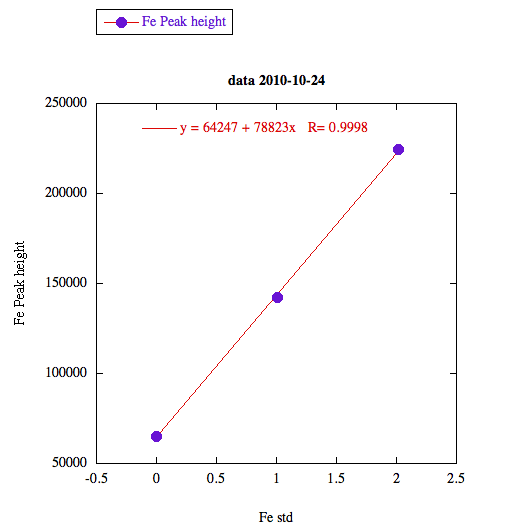 The Fe concentration of samples was determined by dividing the sample peak height by the slope of the Fe standard solution. The standard curve was produced by adding +0 µL (+0 nM), +100 µL (+1.01 nM), +200 µL (+2.02 nM) of the shipboard standard solution into 200mL aliquots of seawater. This seawater was obtained from a 1L sample of seawater (usually from near the chlorophyll max) that had been filtered through a 0.2 µm pore-size Acropack cartridge, acidified with 1 ml of 6N HCl (sub boiling distilled) and microwaved to achieve a temperature of 60 + 10°C. A typical standard curve is shown in Figure 1 below. The shipboard standard solution was 2.020 µM and had been prepared by gravimmetric dilution from a high purity standard solution (1000 µg/mL) at the shore-based laboratory of University of Hawaii. Overall precision is 3.1%, and the average detection limit is 0.064 nM. At sea, the blank calculation of the data was made using the value derived from a sample that had been spiked with EDTA. This process yields a sample that should have no uncomplexed Fe thus allowing subtraction of the system blank. The ICPMS data reported by Miami (Dr. Wu) were only for full depth stations. One of the demi stations were determined at sea on the same day that full depth stations were run specifically GT10-06 and GT 10-07. Thus, these samples were adjusted using the same slope and intercept used for the full depth station. However, the other demi station samples were determined on separate days. Thus, the samples cannot currently be adjusted with existing ICPMS data. The following demi stations have not been adjusted and are not reported: USGT10-02, USGT10-08. Dissolved Fe was determined using a Flow Injection Analysis scheme with spectrophometric detection (Rainin Dynamax UV-C). Major components of the scheme include a Rabbit peristaltic pump, a Dynamax FL-1 fluorometer, a Rainin A/D board, and a Macintosh G3 computer running Rainin MacIntegrator v 1.4.3 to log and reduce data. Samples were collected using a custom-built US GEOTRACES trace metal clean rosette consisting of an epoxy painted Al rosette frame containing 24x12 L GO-FLO bottles. Cast identifier, numbered consecutively within a station. PI-supplied values were identical to those in the intermediate US GEOTRACES master file. Originally submitted as 'CAST No. ', this parameter name has been changed to conform to BCO-DMO's GEOTRACES naming conventions. Unique identifying number for US GEOTRACES samples; ranges from 5033 to 6078 for KN199-04 and from 6112 to 8148 for KN204-01. PI-supplied values were identical to those in the intermediate US GEOTRACES master file. Originally submitted as 'GEO Sample No. ', this parameter name has been changed to conform to BCO-DMO's GEOTRACES naming conventions.